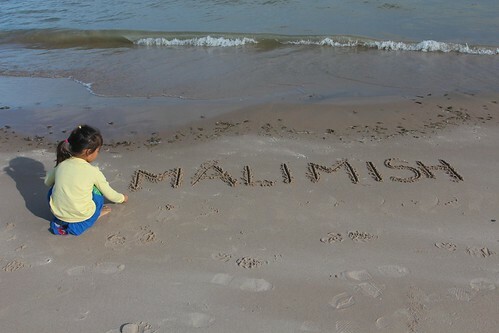 Mali Mish - Day 50: Spending the day at Kohler-Andrae State Park. 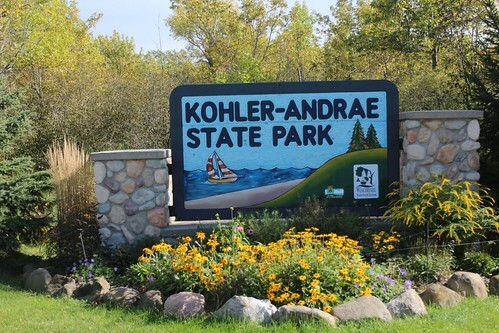 Day 50: Spending the day at Kohler-Andrae State Park. Every 20 or so school days, Ava has to have a meeting with her kindergarten teacher to check on her progress. Even though Marlene is doing the actual schooling, Ava has a teacher at the charter school she is enrolled in with this homeschooling program. Today is her first scheduled meeting with Teacher Stephanie and we came to a McDonald’s for lunch and to use their WiFi so she can have her meeting via Skype. 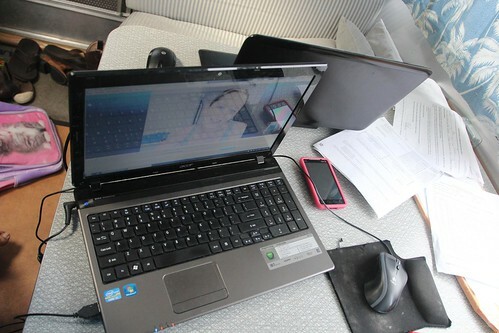 This is a pretty cool way of homeschooling for newbies like us. 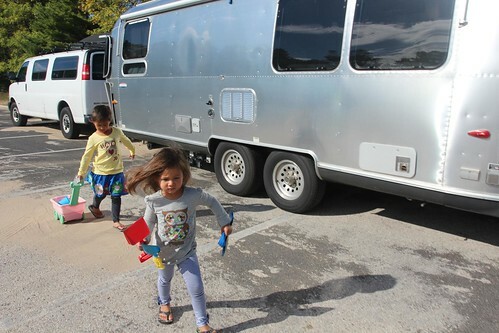 We never thought we would be homeschooling our kids but to make the trip possible, we had to take it on. We have always thought, and was further affirmed after this meeting with Teacher Stephanie, that Ava is having a very uniquely fortunate situation to be able to learn on the road while experiencing all of these great places and things. Perth child care centres will tend to your childrens needs incredibly well. The kids love the experience there as they teach them music, they read them stories and also make them eat healthy! After our meeting was done, we decided to spend the rest of our day at a nearby Wisconsin State Park called Kohler-Andrae. The town of Kohler is directly adjacent to Sheboygan and is the named after John Michael Kohler. He of course is the founder of the Kohler Company whose name everyone in the U.S. should have seen at least a time or two on a sink, faucet or bathtub. John Michael Kohler was an Austrian immigrant who founded the company when he purchased a steel foundry in the Sheboygan area back in 1873. In 1883, he started to apply enamel to some of his cast iron horse troughs and putting ornately decorate legs on them and came up with the companies first bathtub. Many family members of the Kohlers have been very influential both in business as well as politics. Two of them have served as governor of Wisconsin while the grandson of John Michael Kohler is the current president of the company. The park of course is named after John Michael Kohler after a large land donation was made to create the park along with Terry Andrae whose estate donated the rest. There is a great campground here but we are not planning on staying. We are just here for day-use because of the great beach access and views we have right from the parking lot. We would have camped here for a couple of nights except that our new friends Frank and Debbie of StreamingTogether, whom we met in Denver, called me while we were in Saint Paul and told us that his son lives in Sheboygan and would be able to accommodate us for a night or two of courtesy parking. We were thrilled to also find out that they have 4 boys and 3 of them are pretty much the same ages as ours. 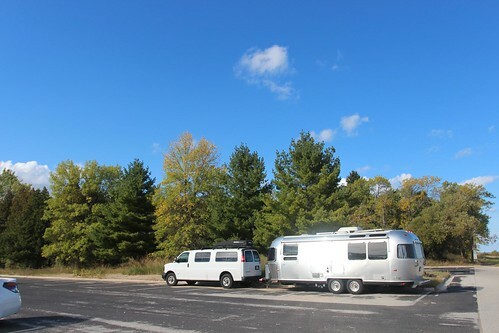 Being that it is Friday and the weather has turned around for the better in the last couple of days, this campground is probably going to fill up. 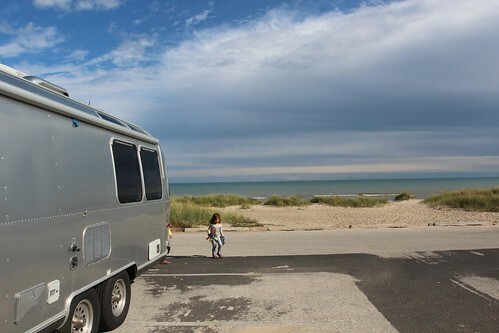 The day-use pass we got today gave us the best of both worlds to be able to enjoy our first, of hopefully a few more, beach days on Lake Michigan and still have a nice place to stay for the night. 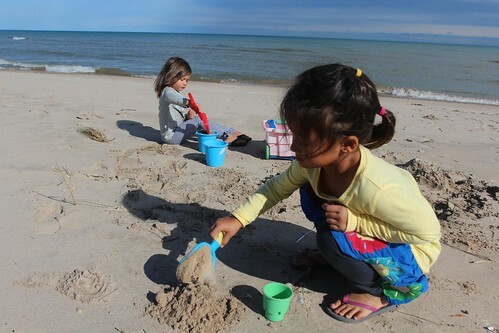 The girls brought out the sand toys we have been carrying for over 4,000 miles and finally put them to their intended use. It even got warm enough with the sun peeking through the clouds for Luka to come out for a little fun. Today reminded me of a couple of days from our last trip across Florida. We stopped for the day at Lover’s Key as well as Sanibel Island and got to park near the water and play on the beach just like we did today. 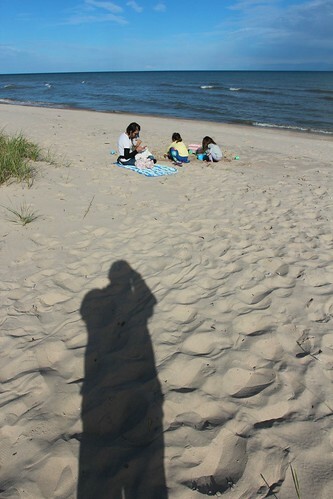 This is my version of our family portrait from our beach day. 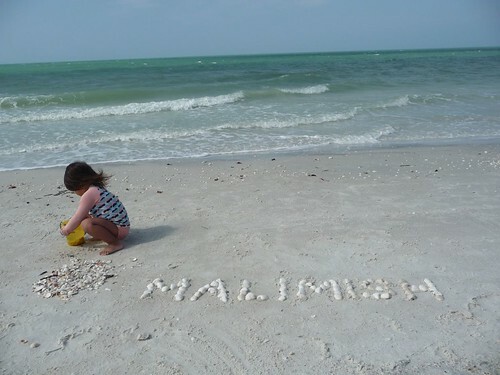 Instead of spelling our name out with shells as we did in Lover’s Key, we just wrote it with a stick since seashells don’t just wash up on the shore like it does in Florida. 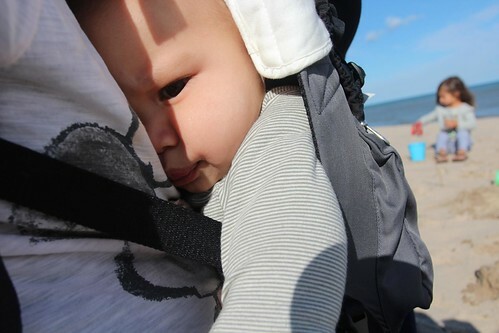 I can believe how much bigger Ava is now as compared to our last trip. In this photo, she was just barely 3 years old. Pretty much the same as Mila is today. We had not expected to have beach days like this until we got to the Atlantic coast so today is really a special surprise for us. 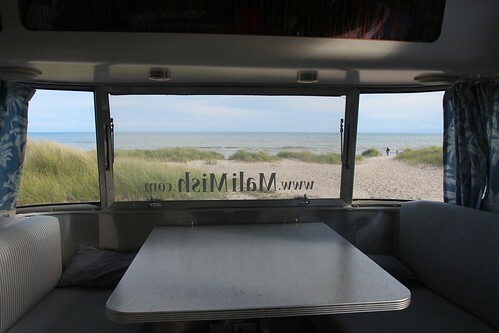 When we came to Kohler-Andrae, we were hoping to be able to park near to beach but to have a view like this for the day is pretty unbelievable. We spent as much time as we could at the beach and headed towards Frank’s son’s home just a few miles from the park just before sunset. Just as Frank said, he has this perfect little dead-end street right next to his house that backs up to a farm for me to park the Airstream. Behind us, there is one of these awesome weathered barns that Marlene has been hoping to find and take close-up photographs of. Let’s hope the owner doesn’t shoot us for trespassing when we sneak up for some snapshots tomorrow. 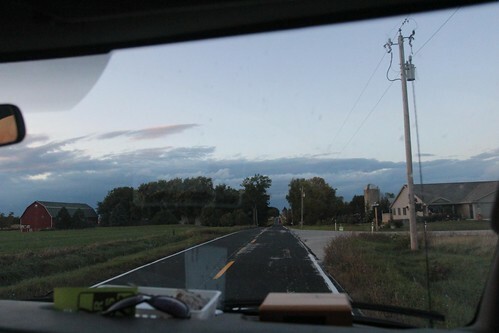 Day 49: Off to Sheboygan for a glimpse of Lake Michigan. 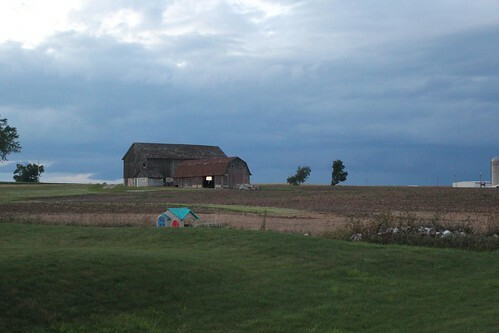 Day 51: Bookworm Gardens in Sheboygan and an old barn. 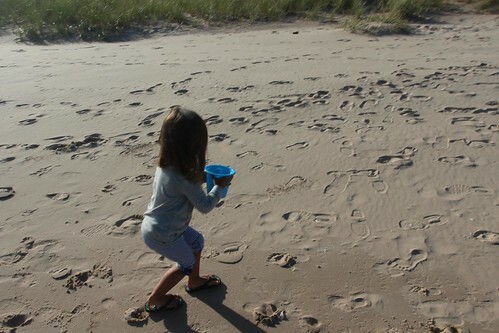 2 Responses to Day 50: Spending the day at Kohler-Andrae State Park. 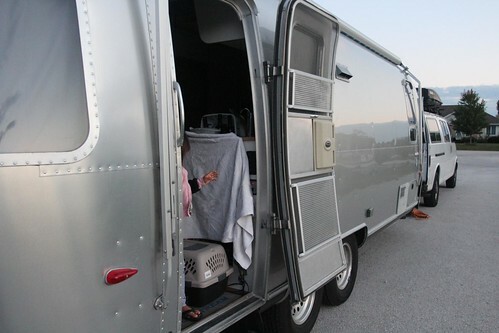 I never wanted to homeschool either, but to be on the road even part-time requires it. 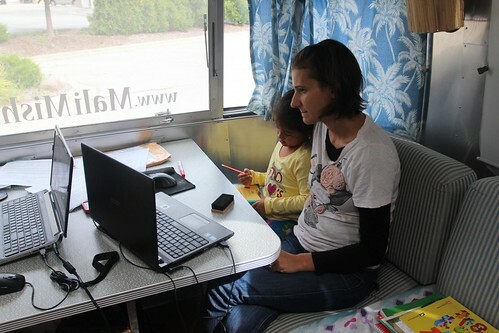 Now I one the freedom & the kids prefer homeschooling over traditional schooling.